Wow, my oldest son is turning 4 this week! He is amazing in every way and today I’m happy to have him share his favorite preschool books for kids from the past year. Our books for children by age are some of our most popular posts! 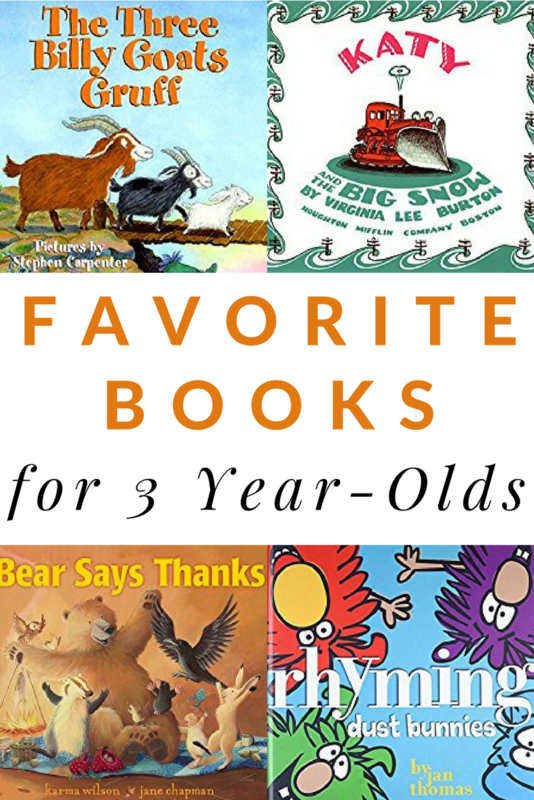 Let’s dive into the favorite and best books for 3-year-olds. As I look through the list I notice that his desire for humorous books really blossomed this year. In fact, he has turned into quite the little joke teller. However, he is a well-rounded reader and enjoyed many classics too! My son loves every book he has gotten by Karma Wilson. It’s hard to pick just one favorite, but he decided it should be Bear Says Thanks. Runner-ups included Horseplay, Hogwash and The Cow Loves Cookies. Another popular and humorous author for this age group is Mo Willems. The Elephant & Piggie books are fantastic and will be some of the first books that your soon to be reader will clamor for. In the meantime, they make great read-alouds. Our all time favorite was There is a Bird On Your Head! Rhyming Dust Bunnies by Jan Thomas was solely responsible for igniting the desire to want to rhyme. Love when a book encourages pre-reading phonemic awareness skills. Get ready for your little one to rhyme all the time! In Xander’s Panda Party Xander decides to throw a panda party at the zoo. But, he is the only panda at the zoo so he decides to invite all the bears. When the koala bear informs him that she is a marsupial not a bear, Xander ponders what to do. He decides to expand his guest list and before he knows it, all the animals are invited to the party. Xander is even more delighted when a special guest arrives at the last minute to his party. Books that required the reader to sing were also a hit this year. We checked out Yankee Doodle Dandy by Hoberman so many times from the library that we really should have purchased it. Other song book picks included, There Once Was a Man Named Michael Finnegan and She’ll Be Coming Around the Mountain. Truckery Rhymes by Jon Scieszka is a super fun book. Traditional rhymes meet trucks is what you will find. For example, instead of “Pop Goes the Weasel” it’s “Pop Goes the Deisel”. My son recited these rhymes all hours of the day. Classic titles also dominated many read-alouds in our house this year. Make Way for Ducklings is a delight to read each time. A pair of ducks search for the perfect spot to build a nest. They find a place they love, but it isn’t conducive to building a nest. After the ducklings hatch, they return to that desired location to live. We read The Little Red Hen by Paul Galdone countless time. We also enjoyed spinoffs of the book such as Cook-a-Doodle-Doo and The Little Red Hen Makes a Pizza. Another favorite classic was Katy and the Big Snow as well as Mike Mulligan and His Steam Shovel both by Virginia Lee Burton. In Katy and the Big Snow, Katy is called on, after a large snowstorm, to clear the roads in the town. It’s a tough job, but Katy works day and night to get the job done. Oh, The Three Billy Goats Gruff has inspired so many fun literacy activities in our house. Almost every time we go to the playground my kids want to act out the story on the bridge. The book also inspired us to make this storytelling sensory bin and wood block props. 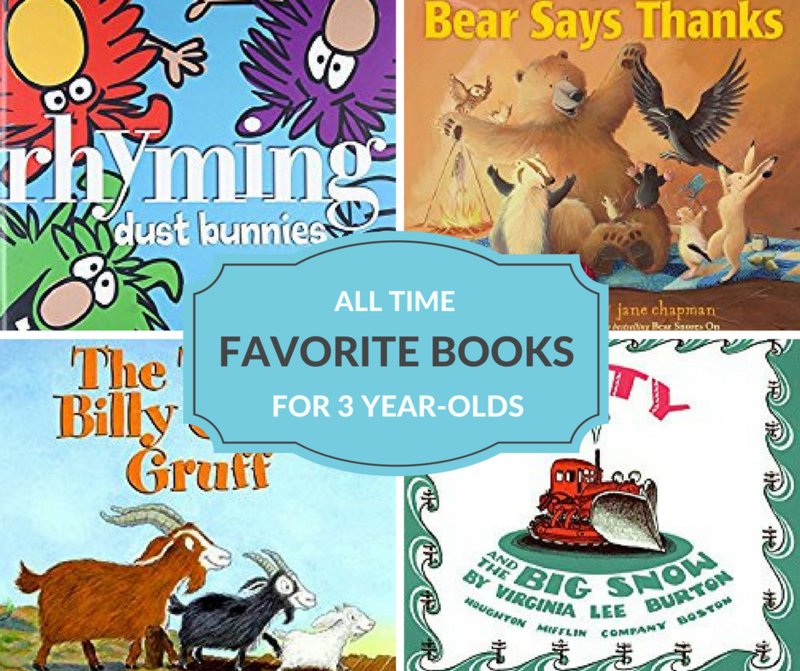 For more favorite books for children by age, check out our past lists. So many of our favorites here! Nice list Jodie! Thanks so much for sharing at the Kid Lit Blog Hop! This is a great list with quite a few books I don’t know yet! Thanks for sharing it at Booknificent Thursday this week! Always great to have you! Oooh! 4 is such a wonderful age.. they are just beginning to discover the “magic” behind books. Mine went through all of Mo Willems and still looks out for the latest (although she is reading chapter books now!) I remember how she would run to the kids section at the library and struggle to carry as many books as she could to the check out 🙂 All your choices are great although I would recommend a few Pure poetry books (Shel Silverstein comes to mind) and Non Fiction as well. I like to make sure that we get a good mix for them at a young age 🙂 Thanks for joining us on KidLitBlogHop Jodie! Hi, Came via the Booknificent link up. The Little Red Hen was a favourite at our place also! These are great books! So glad you stopped by to link up to Quote Me Thursday! What a fun list! Some awesome classics and few new ones I will have to check out! Thanks for sharing this! We’ve only read a couple of these books! I can’t wait to check out the rest! Thanks for linking up at the Thoughtful Spot Weekly Blog Hop! We hope you stop by again next week! I appreciate you posting on #KidLitBlogHop and I’m always looking for great lists to promote reading for young people. When I first read the early part of your post, I misread it and saw that your son was amazed, and I was nodding my head, because yes, at 4, children are AMAZED at everything, it’s a great way to see the world, through their eyes. I’m sure he is amazed and amazing, so happy birthday, and thank him for inspiring another great post. Some new ones to add to my list. Thanks for sharing! Tweeted and Pinned. Great list – we just hung out with Matt Phelan on Saturday, for an interview for “The Write Chat” – so much fun. Bear Snores On is still one of my all time faves by Karma Wilson. Thanks for linking in on the #KidLitBlogHop! Have a super day. Looks like a great list! We are going to have to check some of these titles out! Hope you discover some new gems Judith! Love those sing a long books and I want to read the Rhyming Dust Bunnies with my daughter. Great selection of books. Thanks Bonnie! It’s always so fun to put this list together each year. Thanks for the list. Pinning! This is such an EXCELLENT selection of books! Katy and the Big Snow just melts my heart and will do the same for youngsters. Thank you Ronna. I never tire of reading Katy and the Big Snow either.